Winner: Jeanne Ryan, of Indianapolis. Next week's challenge: This is a two-week creative challenge. The object is to write a conundrum or riddle that starts "What is the difference between ..." — in which the answer involves a transposition of words. Change of spelling in the words is allowed, but not necessary. Entries will be judged on their sense, naturalness of wording, humor, elegance and overall effect. You may submit up to three entries. I will announce my favorites — and the overall winner — in two weeks. If you know the answer to this challenge, submit it here. Listeners who submit correct answers win a chance to play the on-air puzzle. Important: Include a phone number where we can reach you Wednesday, Nov. 23, at 3 p.m. ET. There are some things in life we can all agree on. Time to play The Puzzle. MARTIN: I am joined as always by the puzzle editor of The New York Times and WEEKEND EDITION's puzzlemaster, Will Shortz. Good morning, Will. MARTIN: I hear this is a big puzzling weekend for you. 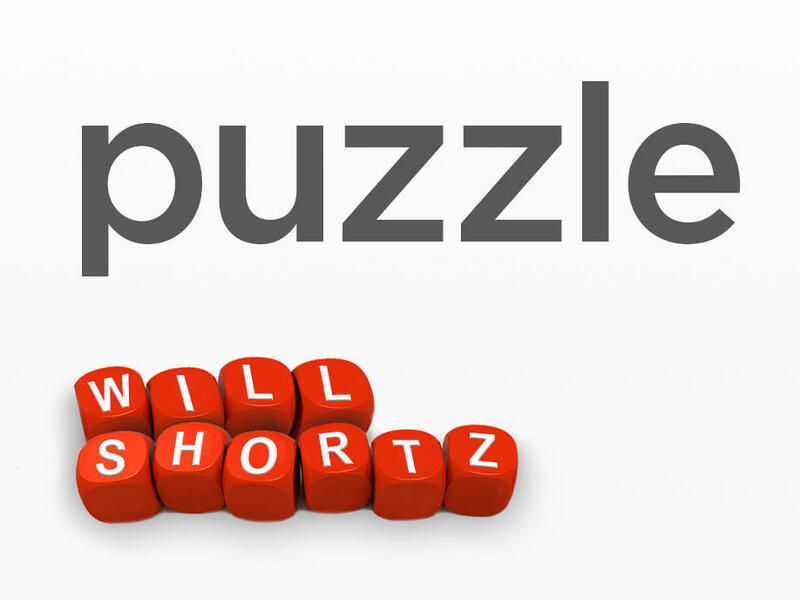 SHORTZ: Well, yeah, puzzles and words. Every November, I direct a whole weekend on words at Mohonk Mountain House in upstate New York. And it's a - there are speakers on words. There's word puzzles. There are word games. And one of the puzzles I'm doing there this weekend I'm about to give you. MARTIN: OK, so remind us of last week's challenge. SHORTZ: Yes. It came from listener Ken Stern of Brooklyn. I said think of a sign that's frequently seen around this time of year, two words, four letters each. And among these eight letters, all five vowels - A, E, I, O and U - appear once each, along with three consonants. What sign is it? And the sign, which you probably saw last Tuesday, was vote aqui, A-Q-U-I. MARTIN: Vote here. So we got just over 700 correct answers this week. Our randomly selected winner is Jeanne Ryan of Indianapolis, Ind. She's on the line now. Hi, Jeanne. Congratulations. JEANNE RYAN: Hi, Rachel. Hi, Will. Thank you. MARTIN: Yeah. So this came quickly to you? Did you have to work at it? RYAN: This one came fairly quickly. It took about an hour. I had a bit of an advantage because I had early voted the day before. MARTIN: So voting was on your mind. RYAN: Exactly. And there were signs around our early voting place that - you know, vote here and vote aqui. MARTIN: Now, you are the randomly selected winner. Are you ready to play The Puzzle? RYAN: I am very nervous. MARTIN: Oh, don't be nervous. MARTIN: I'm lots of help. I'm really, really good at The Puzzle. RYAN: Rachel, I'm counting on you. MARTIN: OK, Will, give us an easy one. SHORTZ: All right, let's try. It's not too bad. Jeanne and Rachel, insert the letters A-R inside the answer to the first clue to get the answer to the second clue. For example, if I said small argument and a tax on imports, you would say tiff and tariff. And the A-R always goes inside the first word. Here's number one. A ballad, for example, and a Polynesian wrap. SHORTZ: ...If you lived in Polynesia. SHORTZ: And a ballad is a song. SHORTZ: There you go. Number two, having uneven terrain and 2016 election name. SHORTZ: There you go. How about a prize - as in P-R-I-Z-E - a prize and toward the back? SHORTZ: There you go. And toward the back? MARTIN: Put an A-R in reward? That's what I'm supposed to do to come up with a word that means towards the back? MARTIN: Another - because there's already in an A-R in reward. SHORTZ: Ignore that A-R that's already there, but add another A-R to get an eight-letter word. SHORTZ: Oh, you almost - rearward. Rearward. Toward the rear. Rearward. MARTIN: Who says that ever, Will? Rearward? MARTIN: You'll find me rearward in the bar. I'll be rearward. SHORTZ: OK, I'm going to Google this afterward. SHORTZ: All right, here's your next one. RYAN: May I take one moment to breathe? SHORTZ: Yeah. I'd like that. SHORTZ: (Laughter) That's good advice. OK, here's your next one. SHORTZ: Shiny as a photo and a brief dictionary. SHORTZ: There you go. Insert A-R, you get a brief dictionary. MARTIN: We got one. Yeah. SHORTZ: ...Here's your last one. Sound mental health and hygienic and clean. SHORTZ: Sanitary is right. Not bad. MARTIN: Wow, we really knocked it out of the park, Jeanne. RYAN: That was a bit of a slog. MARTIN: That was hard. It was not at all easy. RYAN: But I appreciate your help. MARTIN: I think we got a handful of them. I think we can still be proud. So (laughter) Jeanne, I'm going to tell you your prizes now. You get all kinds of prizes. You get a WEEKEND EDITION lapel pin. You get puzzle books and games. And if you want to know what kind of puzzle books and games, you can go to npr.org/puzzle and read all about your prizes. And before we let you go, tell us where you hear us. RYAN: I listen on Indianapolis WFYI, and I'm a member. MARTIN: Great. Jeanne Ryan from Indianapolis, Ind. Jeanne, thank you so much for playing The Puzzle. RYAN: Thank you both, Rachel and Will. SHORTZ: Well, I brought a two-week creative challenge because, you know, next week we're doing something special. SHORTZ: And the object is to write a conundrum or riddle that starts what is the difference between, in which the answer involves a transposition of words. For example, what is the difference between a lucky criminal and some saran with a garden vegetable? And the answer is one beats the rap while the other wraps the beet. MARTIN: ...Will. You are clever. SHORTZ: So change of spelling in the words is allowed, but not necessary. Entries will be judged on their sense, naturalness of wording, humor, elegance and overall effect. You may submit up to three entries. I'll announce my favorites and the overall winner in two weeks. MARTIN: Love it. OK. When you have the answer, a particularly elegant one, go to npr.org/puzzle and click on the Submit Your Answer link. This week, as you heard Will say, you get three answers on this one. Our deadline for your entries is in two weeks, but we're going to do it on Wednesday, not Thursday. Wednesday, November 23 at 3 p.m. Eastern Time. Don't forget to include a phone number where we can reach you at about that time. And if you're the winner, then we'll call you and you'll get to play on the air with the puzzle editor of The New York Times. And he is WEEKEND EDITION's puzzlemaster, Will Shortz. Thanks so much, Will.